Posted on 08. Nov, 2010 by Mike Fieldhammer. A year has gone by since my diagnosis of CMC Joint Arthritis and last week I had my third cortisone shot. See my x-rays and part I of the story here. This one was quick and easy and seems to be fully effective a week later. My pal John Logan came along to film the shot. Video Link: I get a shot in the hand. Aging: A Pool Player’s Gift or Curse? Posted on 05. Jul, 2010 by Mike Fieldhammer. Pool players can have the blind courage of youth or the wise knowledge of the aged. Time moves on and I’m stuck in the Middle Ages, old enough to know better, yet young enough not to care. My left hand. Bridge builder. Click image for more gruesomeness. The complexity of the game and the fact that it can take a lifetime to learn is compelling. One of my favorite things about our glorious pastime is that it can be enjoyed by 10-year-olds and people into the nineties. I’ve taught eager young grade-schoolers as well as competitive elderly couples. The arc of aging certainly has an effect on a serious pool player. At what age does one’s game peak? Many players say that they never played as well as they did around age 18. They never missed and were never scared. 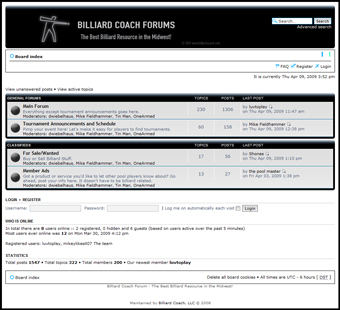 Some players learn patterns and smart table management in mid life. Some veterans have steely nerves and play like they’ve got nothing to lose. For me, age is impacting my physical abilities in ways I never expected. Late last year I started having severe pain in my left hand near the base of my thumb. The soreness had come and gone for months but in October 2009 the pain became constant and seriously detrimental to my pool game. Mere days before my 40th birthday, I had my first MRI. The friendly reminder voice mail I received said to show up at 10 am on October 30th (the day before Halloween) for my MRI at the “Maple Grave, excuse me, Maple Grove office.” Spooky, huh? The MRI seemed like overkill for what turns out to be Osteoarthritis of the CMC or Basilar joint. The temporary solution was to gulp down four Naproxen pills three times per day to decrease the swelling in the area and tame the pain. Pool playing over the next couple months was a nightmare. At best, an open bridge stung like a bee was attacking my left hand and at worst, pain of touching the cloth sent tears welling up followed by more of the emotional nature after the one stroke shot. The mental toll of playing so far beneath my capabilities was a complete surprise to me. Could you imagine being Carl Lewis in his prime with cinder blocks tied to his ankles being beaten in a 40 yard dash by a middle aged chubby banker who jogs at the club to meet girls? I went through months of not wanting to see a pool table. Thoughts of selling all my gear and flushing my billiard instructor career surfaced daily. All this came to a head when I sought other physicians’ opinions after a couple of friends offered referrals. On December 17th, I had a cortisone injection. Within the day, I could tell that it was treatment leagues above the pain pills. The following weekend, I finished third in a very difficult regional bar table 8-ball tournament. With my mind largely free from pain distress and genuinely excited to play pool, I had a successful week and gained a sense of hope for competitions to come. 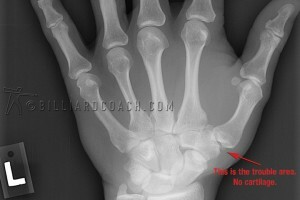 My options for treatment in the future are to continue cortisone injections three times per year or have hand surgery. Once again in April I had a cortisone injection prior to a tournament and our team won in Minnesota and took the top spot in Las Vegas for the Mixed Open Team BCAPL Championship. Currently, I’m not sure when the surgery will happen, but one thing I do know is that aging as a pool player has plusses and minuses. Physical challenges may creep up on aging players, but care for one’s health and the knowledge and experience can make players competitive at any age. After all, Ralf Souquet is still at the top of his game and he is one year older than I am. Medical notes: What is Osteoarthritis? Arthritis literally means “inflamed joint”. The cartilage-covered surfaces of a joint wear out and cause bone on bone irritation and pain. I think I have a legitimate pool player injury hastened with a dose of hereditary influence. Here’s an image of my x-ray that shows the affected joint in my left hand.